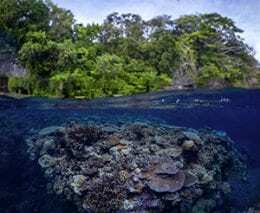 It would be fair to say that diving Truk Lagoon would be every tech diver’s dream – but you don’t have to be a tech diver or necessarily have a lust for rust to enjoy diving Truk Lagoon. 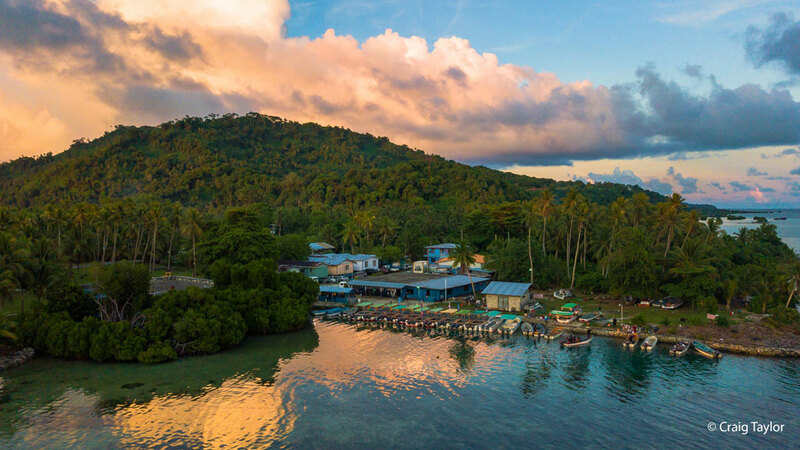 Here’s our guide to the best way to dive Truk Lagoon, the right time to visit, what you’ll see and a variety of accommodation/liveaboard options. Truk Lagoon (also referred to as Chuuk Lagoon) has one of the highest concentrations of wrecks, enclosed in a relatively small lagoon. 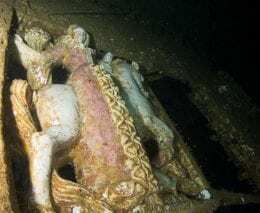 Though most of the wrecks were Japanese transports (“Maru”), they hide a variety of cargos, and there are also submarines, tenders and planes. 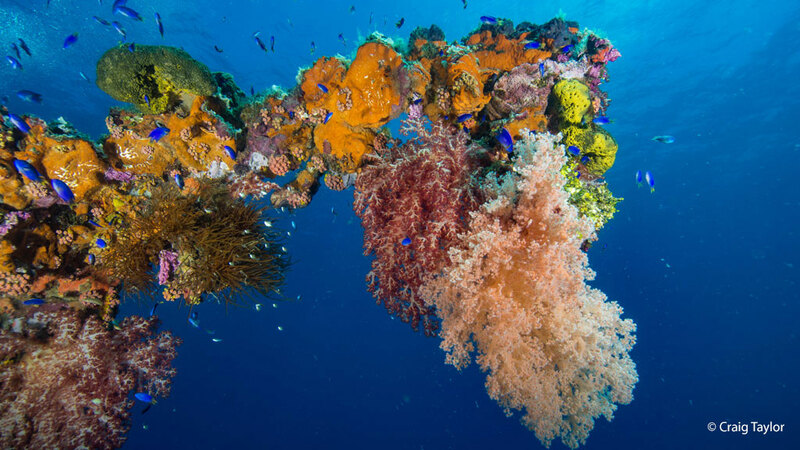 Many extend to depths beyond 40 metres – considered the limit for recreational divers – but there is still plenty to see at sensible depths, and much of it is covered in colourful coral. As experienced by Craig Taylor who kindly provided the photos for this page from his recent trip to Blue Lagoon Resort – which you should read about too! Truk has an interesting climate. The day time temperature is around 30°C / 87°F, every day, and the average night time temperature 25°C / 76°F, every night. It rains (at some point during the day) on about 218 days every year, which means it rains two out of every three days and there are, on average, six hours of sunshine every day. In summary, it’s sunny half the time, raining two thirds of the time and hot, hot, hot! all the time. 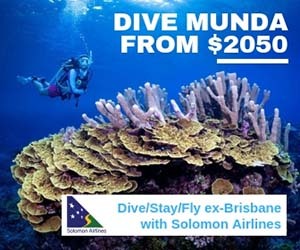 But that’s ok because you’ll be diving most of the time. Despite its great climate, like much of Micronesia, Truk is not renowned for its culinary delights. There are no verdant fields, lush meadows or cool, vine covered slopes, so apart from a few fresh (tropical) fruits and veggies, everything is shipped in vacuum-packed, frozen, dried, canned or bottled. (There’s a tax on food, and a higher – 50% tax – on alcoholic drinks). Another thing about Truk – it’s a wee bit remote. 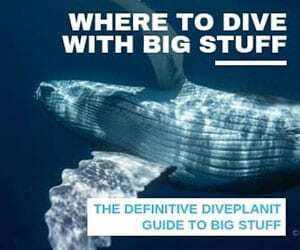 Which means that when things break, or replacement parts are required, or you forget to bring something, often you can’t just pop down to the local hardware store/dive equipment shop/drug store/7-Eleven to get the thing you – or the boat/hotel/liveaboard operator – needs. And sometimes you need to live with that. And don’t think Air Niugini is some second rate airline – they have a large fleet of modern, efficient Fokkers. The best way to get to Truk from the US is with United on a flight that also stops off at Guam. There are plenty of options to choose from, including a resort, a floating hotel, and two liveaboards – described briefly below. Here are some examples for on a 7 night stay, per person based on double occupancy and including sales tax (5%), Dive Permit (USD 50) and transfers. The Blue Lagoon Resort (BLR) has 54 spacious, air-conditioned rooms across two levels, all with a lagoon facing balcony. A selection of Pacific and Asian themed meals are served in the airy, air-conditioned dining room. You can meander through the palm shaded gardens to the white sand beach for a refreshing swim in the clear lagoon. BLR has number of boats catering for all kinds of divers from Tec to Rec and drops small groups on different wrecks throughout the day to ensure there’s no crowding and everyone gets a great dive in good vis. 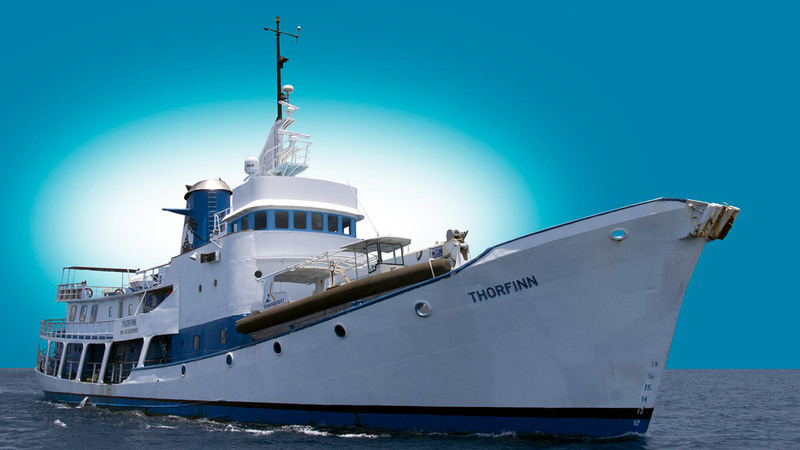 The SS Thorfinn is a floating hotel using two tenders to deliver divers to the scattered dive sites. The Thorfinn has 10 cabins, 7 with private bathroom and three with shared facilities. The guest lounge is equipped with a Plasma TV with DVD player, a CD player with iPod connection, and surround sound speakers. The dive schedule allows for 5 dives per day, and the Thorfinn caters well for tec and CCR divers. 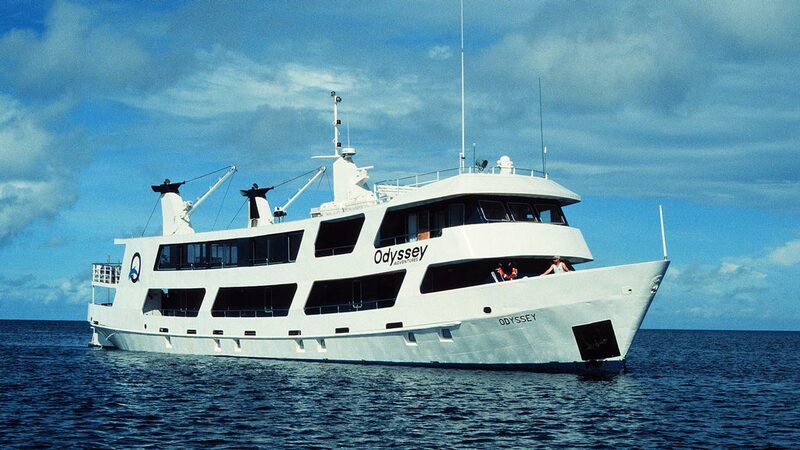 The Truk Odyssey is a liveaboard that does a circuit of the lagoon over the 7 day trip, mooring close to each of the wrecks, so that practically all of the diving is done from the mothership. 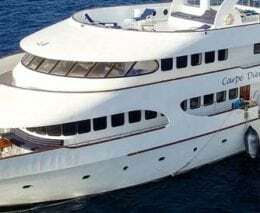 At 40m long and with just nine Staterooms, each is commensurately generous, and comes with private bathrooms and individual air conditioning control in each cabin. 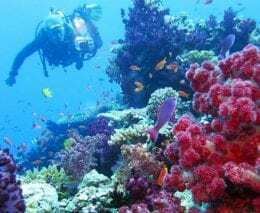 During the 7 day trip, there are six days of diving, with up to 5 dives a day. The meals are served buffet style in the dining area with views to both sides, and includes all beverages – beer, wine, and distilled spirits. There’s also a spacious entertainment centre and sun deck. 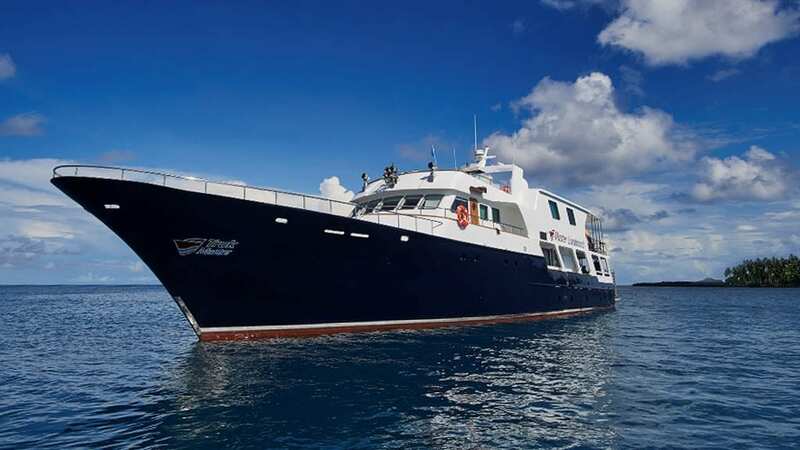 Built of steel, the Truk Master is the newest liveaboard to ply the waters of Truk Lagoon, welcoming aboard 16 guests for 7 or 10 night Truk Lagoon dive safaris. Four decks provide ample space for relaxation, dive equipment and camera preparation, whilst the experienced crew ensures dive guest receive a high service level throughout the trip. 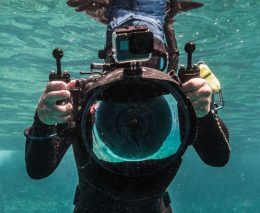 The Truk Master schedules three dives each day plus a dusk or night dive with diving taking place directly from the boat’s dive deck and rear platform. If you do have a lust for rust, and want to see some really big stuff – including a 270m/888ft long aircraft carrier complete with aircraft – then the Marshall Islands and Bikini Atoll is the place to go. Bikini Atoll is where the Americans tested the impact of their nuclear bombs on a ‘mock’ naval fleet – a collection of damaged ships (and planes) of all kinds from the US, Japanese and US fleets. As well as the wrecks themselves, most have become artificial reefs and are home to prolific marine life. 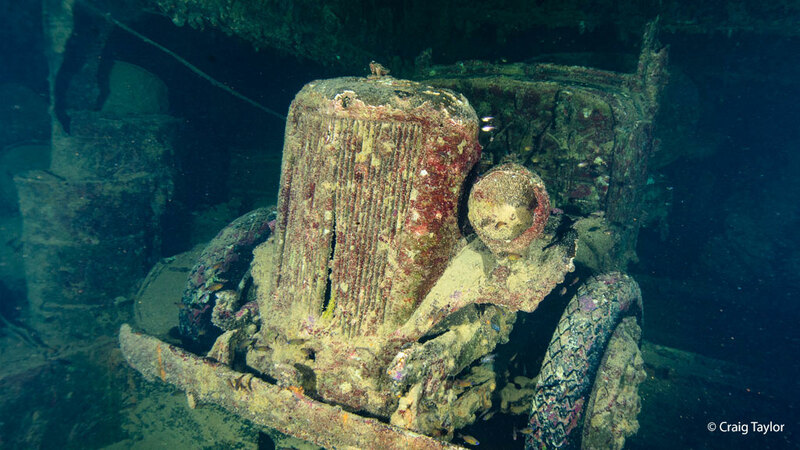 The Truk Master offers 11 to 14 night itineraries (download a sample here) from Kwajalein in the Marshall Islands which includes diving on the Prinz Eugen, a German heavy cruiser at Kwajalein Atoll, the wrecks of Bikini Atoll, and Majuro. 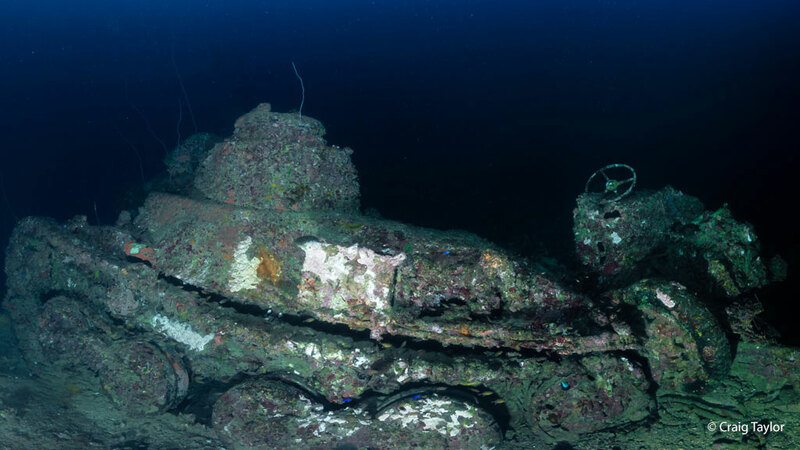 Note that as most wrecks at Bikini Atoll extend beyond recreational depth limits, this particular itinerary is recommended only for technical divers with previous wreck experience. Given the relatively consistent climate, the best time to go is when there’s availability with your selected operator and away from holiday times when cheap flights are available. What are you waiting for – enquire now with your travel window – and we’ll get you some fully priced options. If you liked this post, you might also like Bucket List #1 – Palau or Bucket List #2 – The Maldives.